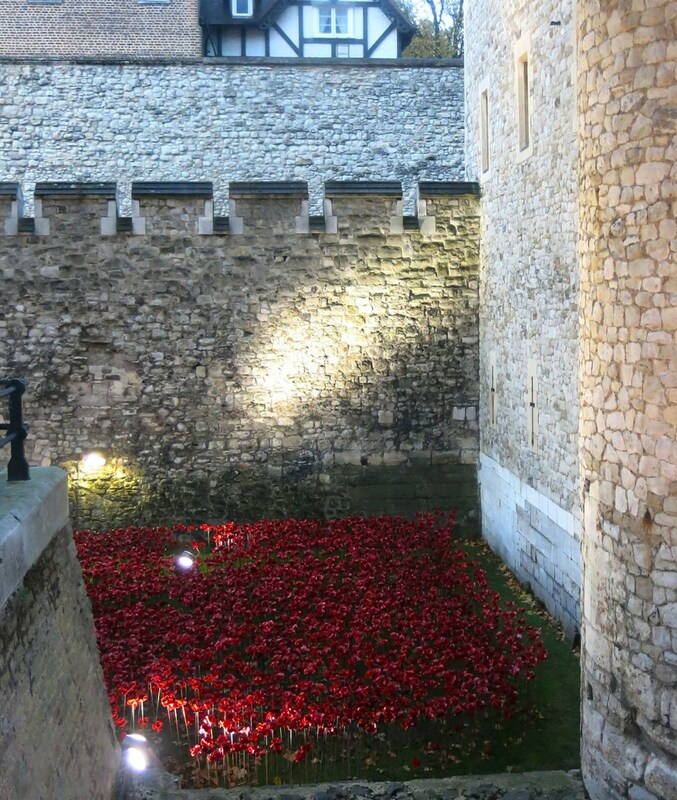 Boris Johnson, the Mayor of London, wants the poppy installation around the Tower of London to remain. Currently, as I write on the 6th November, it has had over 4 million visitors. My images were taken a week or so back, and the whole work will not be finished until, symbolically the 11th hour of the 11th day on the 11th month – the time the armistice was declared to end the First World War. Three of my relations died in France, and one of my partners. Grandad, I was told, suffered the after effects from a gas attack until his death in the 1960’s. OH and I have bought one of the ceramic poppies in memory primarily of her Australian antecedent. Emigrating from Laughton in Sussex to Australia in pre-war years he returned with an Australian gun battery in 1916 to be buried in France. 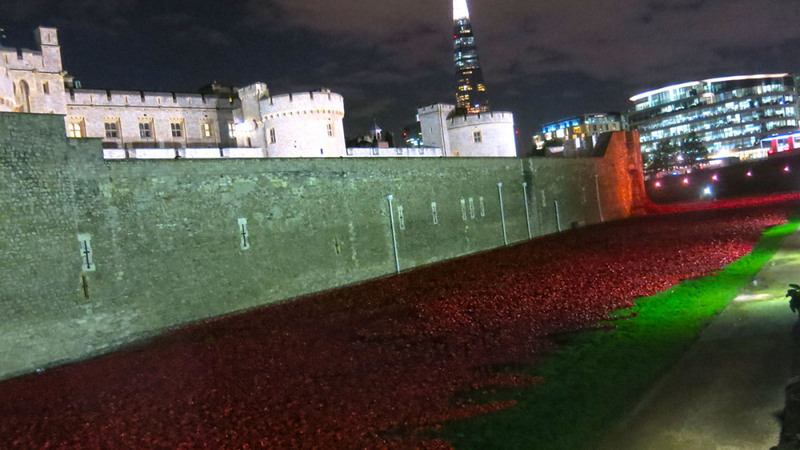 This amazing piece of memorial art fills the moat with hand-made ceramic poppies. As the Tower was used as an initial training centre for WW1 recruits from the City of London this location is appropriate. Given the rȏle of the moat as the defensive work of William the Conquerors great castle it is entirely appropriate too that the red of the poppies symbolically fills it with blood. 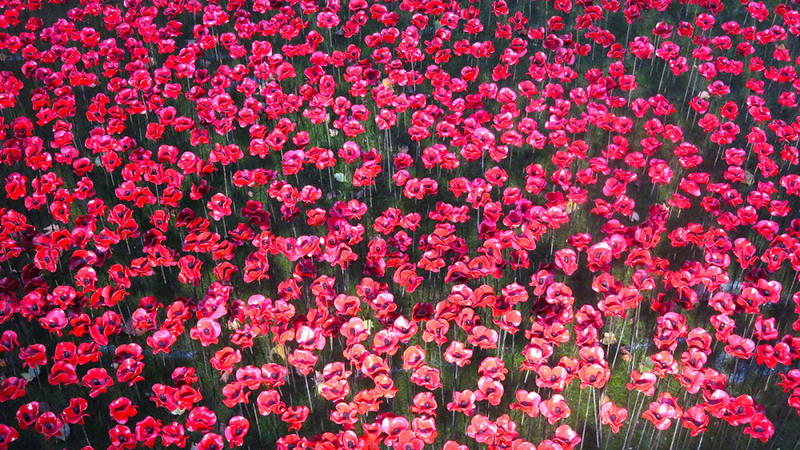 There will be a poppy representing each man killed from British and colonial forces – a total of 888,246. Each evening the Yeoman Warders of the Tower, the Beefeaters, play the Last Post and read names of some of the dead from what is now the Commonwealth, a ceremony that is listened to in silence and sometimes with tears. 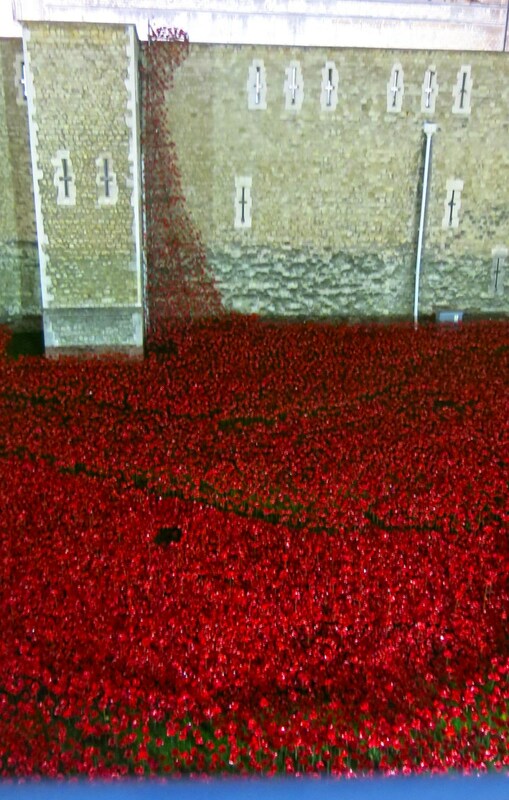 This ‘Blood Swept Lands and Seas of Red’ is an intensely emotive art installation. The symbolism and effect magnified by its location it seems to me to represent not just the victims of WW1 but all those who died in the Tower since construction in 1089, and the many who have died since WW1. In the years since WW2 apparently there has only been one year when a British Soldier has not been killed in action somewhere on the globe – 1968. This memorial is moving and unforgettable. It has to be seen to be believed. Walk all around the Tower. Go see it.